1. Stop acting like you are the expert on a multiples pregnancy because you have googled it. Until you have grown a basketball team inside your body, carried them around for months and experienced all of the pain that goes along with carrying multiples you don’t know what you are talking about. 2. Stop telling her she’s going to have her hands full. Do you think she was planning on having one baby raise the other(s)? Of course she knows it’s going to be busy. 3. Stop telling her that your cousin’s friend’s mother knows someone who had multiples. Just stop, she doesn’t care. 4. Stop asking her how much weight she has gained and if she has any stretch marks yet. Just because you know her body is being pushed to the limit doesn’t mean every war wound should be public knowledge. Let the woman keep some shred of dignity. 5. 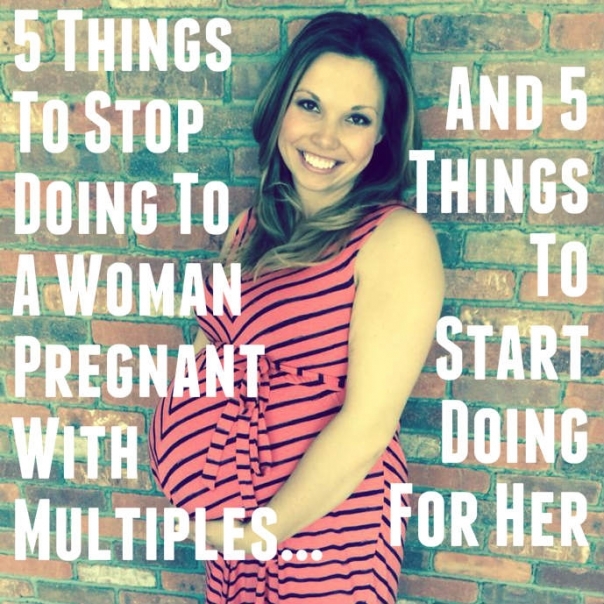 Stop comparing your singleton pregnancy to her multiples pregnancy. It’s not the same and she may stab you. 1. Start taking her out to restaurants. She has probably been instructed to pack on the pounds. She might as well be doing it with good company. 2. Start offering to drive her to her millions of doctor appointments, non-stress-tests and ultrasounds. Chances are she is finding it hard fitting behind the wheel, getting light headed while driving and let’s face it, a little lonely at all of those appointments. 3. Start cooking meals for her. Between the smells of cooking putting her nausea into overdrive and standing on her feet cranking up her braxton hicks contractions, the last thing a soon-to-be mama of multiples wants to do is spend any time in a kitchen. 4. Start taking her older children off her hands for a while. They are probably so bored of watching T.V. while mommy lays on the couch multiplying like gremlins. 5. Start telling her “she’s got this”. Remind her how strong and brave she is and that you know she can rock this mom of multiples role! To all of the well meaning friends, family and in-laws in my life! You might also like What It Is Like To Be Pregnant With Twins – My Personal Journey. Don’t forget to follow Nesting Story on Facebook, Instagram, Pinterest and Twitter! Happy multiplying! Oh my goodness, all true! Although people never seem to stop telling you about how their cousin’s boyfriend’s boss is a twin. I just smile and say ‘Really? Wow!’. Honestly, where do people expect the conversation to go from there anyway? I know, I have perfected the fake smile when I get mauled in Walmart! So glad you liked it Nikki! Ugh! Yes, people always come up and say “you’re going to have your hands full”. Cue fake smiles from me and my husband. Another thing people ALWAYS ask is: “are there twins in your family?” Who cares if there are twins in my family? And the answer is NO! Even though there are fraternal twins in my family, I’m having identical twins, which I hear is not hereditary anyway. I just hate the question. Loving your blog! I’m 36 weeks and 3 days…can’t wait to meet my boys!